Paneer remains the most common type of cheese used in traditional South Asian cuisines. The use of paneer is more common in Nepal, India, Pakistan, and Bangladesh due to the prominence of milk in their cuisine. It is very popular when wrapped in dough and deep-fried or served with either spinach (palak paneer) or peas (matar paneer). We consume green peas a lot not just because it has got a supercharged nutritional profile but for its delicious flavor, wonderful texture, and eye-catching color. Matar (Peas) are good sources of protein, vitamins, iron, manganese, Potassium, Fiber, etc., and a regular consumption of Green Pees can keep you healthy. On the other hand Paneer(Cottage cheese) is an excellent source of calcium and makes your bones stronger & helps to prevent and reduce the back and joint problems. Considering all these nutritional benefits, “Matar Paneer” is a very healthy and delicious dish. 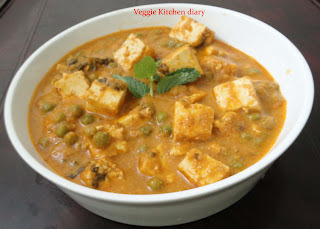 Matar paneer is a simple yet tasty vegetarian dish from the northern part of India around New Delhi and the Punjab. Pair it with a piece of naan or chapati to make a full meal. 1.Grind onions, ginger, tomato, laung and moti elachi to a smooth paste. 2.Heat oil in a kadai,add the onion-tomato aste.Cook covered on high heat for about 5 min till quite dry.Remove cover and cook,stirring continuously for 5-7 minutes till very thick abd absolutely dry. 3.Add coriander powder,red chilli powder,amchoor owder and garam masala.Reduce heat and cook for 5 minutes more till oil separates.The masala should be dry and look glossy because the oil separates which makes the masala as well as the sides of the kadai turn glossy. 4.Beat yogurt with a wire whisk or fork till smooth. 5.Add well beaten yogurt to the masala,stir continuously for about 3-4minutes,till oil separates again and masala turns to a bright red colour. 6.Add enough water,about 2 1/2 cups water,to get a thick gravy.Add salt to taste,about 1 tsp salt.Cook the gravy for about 5minutes on low heat till oil seperates and comes to the surface.Add peas.Cook till peas are done. 7.Add paneer and 1/4tsp garam masala.Cook on low heat for 3-4minutes till paneer gets soft.